Our judges have weighed in! Go to the IBM Watson Developer Challenge gallery to congratulate the winners and check out all of the great submissions. Join Zach Walchuk for weekly office hours on the WDC Slack Channel. Register for the Building with Watson webinar series, featuring expert tips and technical updates to help you continue building or improving your app. The submission deadline is nearing! Is your Bluemix trial close to expiring? Thanks for your interest in the Watson Developer Challenge for Conversational Applications. Just a reminder, the submission deadline is Friday, April 15th at 11:45pm PST. You will need to have a working application running for our judging period next week, so if your Bluemix trial is close to expiring please email us at wdc-dev@bg.vnet.ibm.com to request a trial extension. Just a final shout-out that you have three days remaining in the IBM Watson Developer Challenge for conversational apps. Submissions are due April 15 before 11:45pm PDT. Find out what time that is in your city. We’ll walk you through all the steps of the hackathon submission form in this quick video tutorial. Whew, it’s the home stretch! There’s only one week left to submit your conversational app to the IBM Watson Developer Challenge. Submissions are due April 15 before 11:45pm PDT. Find out what time that is in your city. If you’re unsure about how to submit a project on Devpost, no worries! 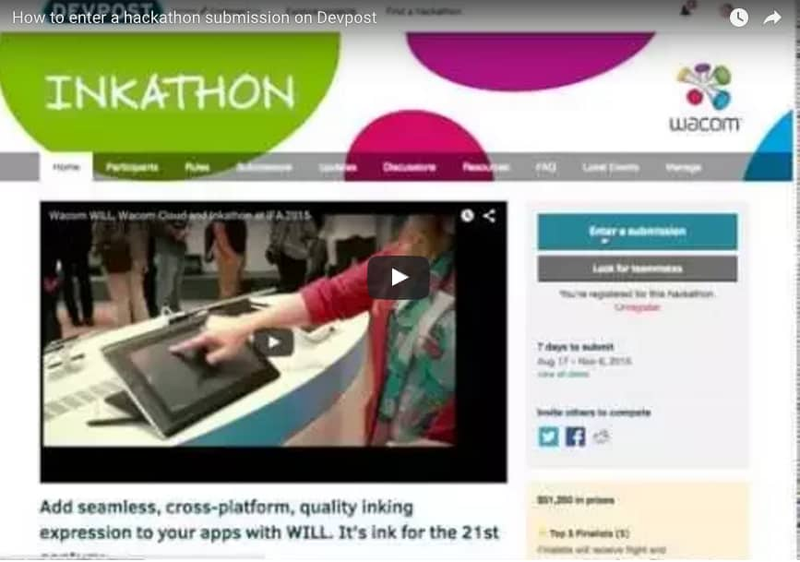 We’ve got a video tutorial on how to use the hackathon submission form. There are two weeks left to build a conversational app using the Watson Dialog, Retrieve and Rank, Natural Language Classifier, and Document Conversion APIs. Submissions are due April 15 before 11:45pm PDT. Find out what time that is in your city. The submission deadline for the IBM Watson Developer Challenge for Conversational Apps is April 15th, 2016. That’s just over two weeks away! As you prepare to deploy your application, we want to provide you with the resources to do so seamlessly. Want to see it done live? Check out our walk-through with expert Jake Peyser. 3 weeks to go: start your submission now! There are three weeks left in the IBM Watson Developer Challenge! Beat the deadline rush by getting your submission ready early. Submissions are due April 15 before 11:45pm PDT. Find out what time that is in your city. And if you’ve never submitted a project on Devpost before, check out our quick video tutorial on how to use the hackathon submission form. Speech to Text/Text to Speech: Ditch the keyboard and let your app talk with its users. Perfect for automated phone systems, universally accessible apps, and robots. If you’re using the Dialog service, be sure to check out IBM’s Application Starter Kit for a dialog template. No need to start from scratch! The submission deadline for the IBM Watson Developer Challenge for Conversational Apps is April 15, 2016. As you get started working on your app, you may want to check out these tips for developing with & making the most of the Watson Developer Cloud APIs. Use the Dialog API to script your conversations and keep them moving smoothly. Use the Retrieve and Rank API to find answers to less commonly asked questions. Use the Document Conversion API to prepare your data for other Watson APIs. Did you know there is a series of webinars that cover various topics surrounding building a conversational application? From an overview of the four Q&A services (Retrieve and Rank, Document Conversion, Natural Language Classifier and Dialog), to a deep dive into useful API combinations, the Building with Watson webinars compile knowledge from Watson developers that will help you win this challenge. The next webinar in the series is taking place this Wednesday, March 9 and will cover tips and tricks for getting your application deployed on the Bluemix platform. Register for the session. Thanks for joining the IBM Watson Developer Challenge for conversational apps! You're officially registered now, and we’ll be sending you regular updates throughout the competition. Here’s how to get started building your interactive app with the Watson Developer Cloud APIs. Submissions are due April 15, 2016, at 11:45pm pm PDT. Plan your attack. Visit the resources page for instructions on how to sign up for your instance of Bluemix, plus an overview of the Watson Q&A service APIs, technical webinar links, and loads of other helpful tools.